I’m starting to get a little obsessed with what I put on my skin. At 25 years old, I’m already dealing with, and I don’t want to say wrinkles because I don't think they're there yet, some fine lines on my face, especially in my undereye area (all thanks to years of rubbing my eyes, good job Camie!). My sister, Cat, was 25 when she first started using Olay. I remember her having the classic pearl and black colored bottle of moisturizer in our shared bathroom, and I may or may not have snuck around and tried it on my face a few times. I was too young then, at the age of 15, to even start using Olay products but I’m 25 now which is the same age she started using Olay! And guess what? She still looks about my age. I’m not kidding. People always mistake her to be in her mid or late 20’s. 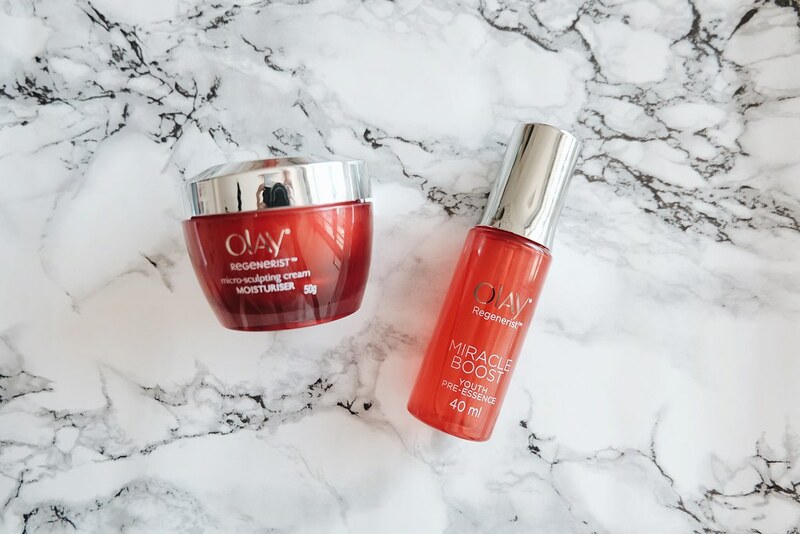 I know I wouldn’t mind looking as young as I can for as long as I can!So, when Olay wanted to send me their new Miracle Duo line, I said an eager yes and the moment I received the package, I didn’t hesitate a moment to try on the duo. But before my review, let me talk a little about the new Olay Regenerist Miracle Duo. The Miracle Duo is made up of the Miracle Boost Pre-Essence and Micro-sculpting cream, and they work best when used together. The Pre-Essence helps the active ingredients of the Micro-sculpting cream penetrate deeper into the skin for dramatic results. The Miracle Boost Pre-Essence is designed to boost the penetration of anti-aging actives of the moisturizer, the Micro-sculpting Cream, to increase cell metabolism and renewal for beautiful, youthful skin that looks up to 10 years younger. So, since I started using this at the age of 25, by the time I’ve finished the entire bottle, I’ll look about 15 again and will start getting ID-ed at clubs. WOOHOO! 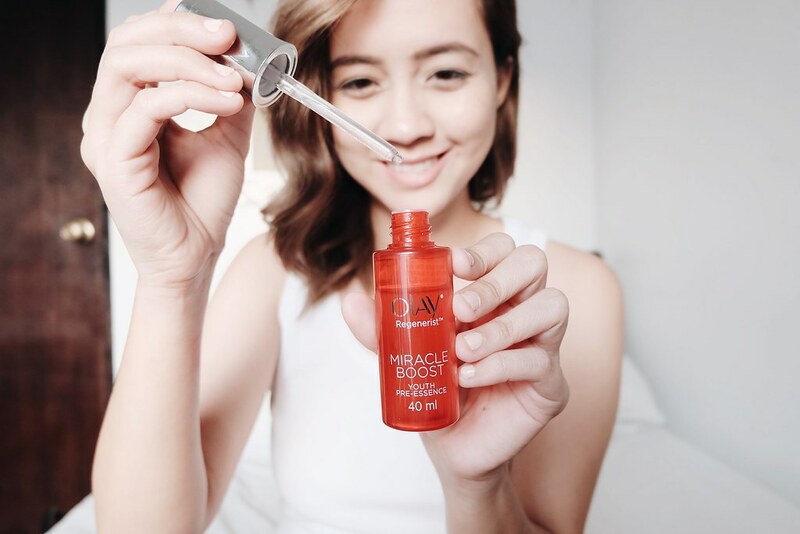 A single drop of the Miracle Boost Pre-Essence starts renewal of a million surface cells and helps visibly reduce fine lines and wrinkles, pores and firms the skin (all skin issues of mine, unfortunately). 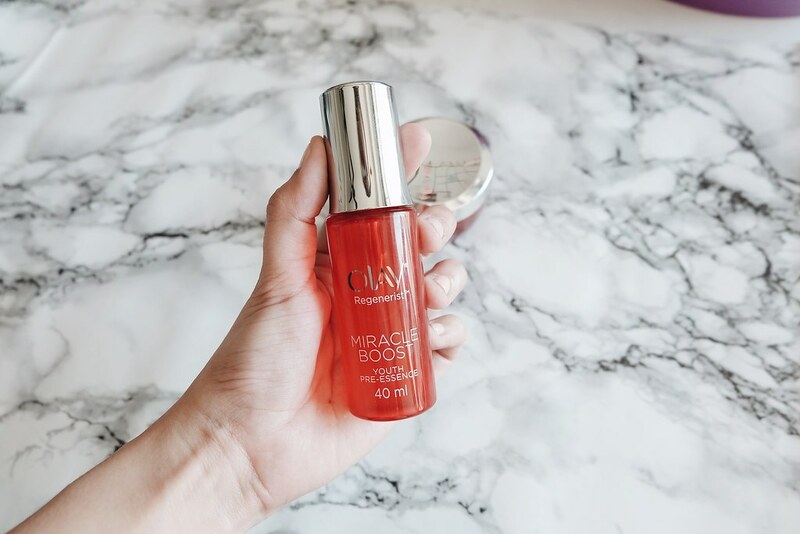 After cleansing your face, pat it dry and start to apply the Olay Regenerist Miracle Boost Pre-Essence on your forehead, cheeks, nose, and chin. Let your skin absorb the product for a few minutes. 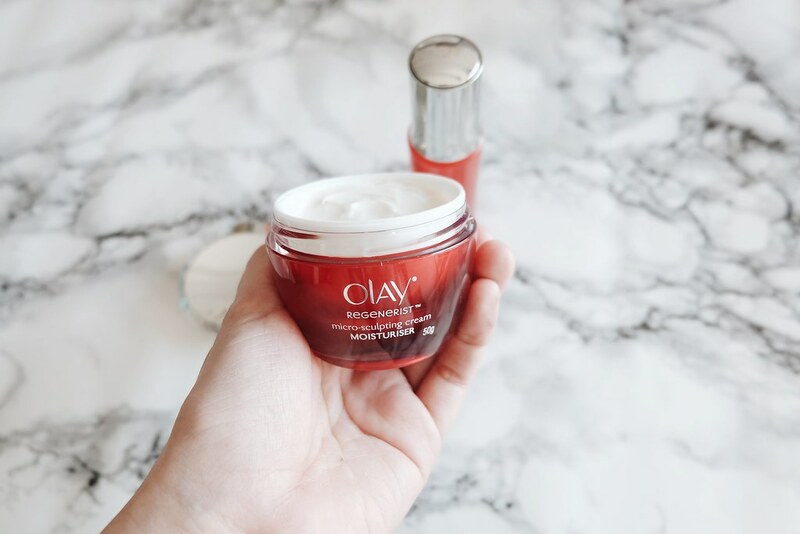 Apply the Olay Regenerist Micro-sculpting Cream on your forehead, cheeks, nose and chin. Use the Miracle Duo twice a day, morning after your bath and then before bedtime, for best results! Has a bit of an “oily” finish for a few minutes, which I believe is really good for my perpetually thirsty dry skin. The first time I used the Olay Regenerist Miracle Duo, my skin didn’t react so well. My face started to get a little itchy, sometimes red in certain spots, and within the next few days I broke out. I was worried I was allergic to the products, but my reactions weren’t extreme. So I thought maybe my skin was just shocked at this new change I introduced it to after getting so used to my cleanser + moisturizer routine. I would like to note that my skin is already dry/sensitive to begin with. I really liked the products though, because despite the initial negative effects I still noticed that my skin always felt more moisturized, supple and even bouncy after applying the two products. The new Olay Regenerist Miracle Boost Youth Pre-Essence (Php 1,399) is exclusively available at http://lazada.com.ph/Olay, while the Olay Regenerist Micro-sculpting Cream (Php 1,499) is available at Lazada, leading drugstores, department stores and supermarkets. For latest on Olay, you may check their official website at http://olay.com.ph. You may also like Olay on Facebook or follow @OlayPhilippines on Twitter and Instagram. Disclosure: This is a sponsored post for Olay Philippines. However, the review is an honest account of my thoughts and experiences with the products sent to me.